In our previous post, we discussed some tips to help you as you prepare for your real estate licensing exam. Whether you find tests to be easy or difficult, we have the tips that will help to make your entire preparation and test-taking process smoother. Continuing Education for Licensing can direct you to the approved continuing education courses necessary for your real estate license renewal, as well as the test preparation aids you need. Contact us today and let us help you prepare for your exam. As with any other major tests available today, you are sure to find an exam prep aid that will help you in your studies. Whether you wish to find a study group, or simply work through an exam prep aid on your own, there are a number of different options available. 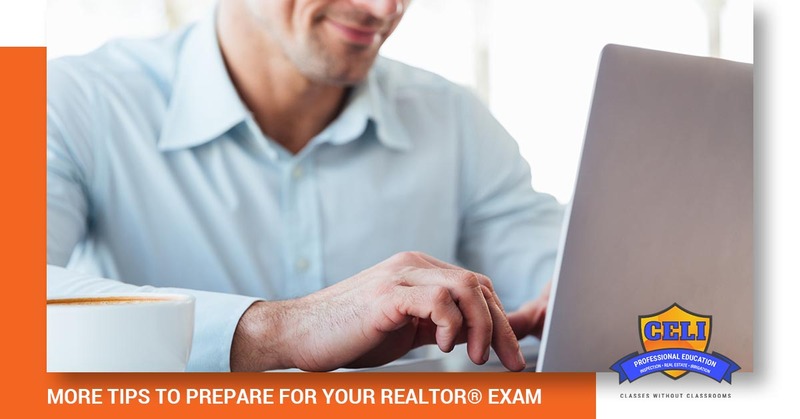 One of the benefits of an exam prep aid is that it will help you prepare for your real estate license exam in the way that works best for you. Maybe you prefer to receive immediate feedback on each answer so that you can focus on that one question to provide a better answer. Perhaps you prefer to take the test as if it were the real exam where you receive no feedback until you are done. If you are more concerned with learning how to take tests faster, then there are options to assist with that as well. Some people are better at tuning out distractions than others. If you are using an online program to help you study, but find yourself constantly distracted by pop-up ads and banners, then you should get a distraction blocker for your computer or laptop. There are a number of programs available for just this purpose. They are able to temporarily block websites so that you are able to focus on your studying. Whether you are easily distracted by time-wasting sites that offer quizzes, sports updates, or social media interaction, there are programs that you can utilize to block out certain websites for a set amount of time. In fact, if you need more help with focus, you can even choose to set a weekly recurring block. Setting a timer can be useful when you are studying for several reasons. If you have a hard time settling into the routine of reading, memorizing, and quizzing, then a timer can help you to stay focused on what you need to accomplish during that period of time. Spending too much time in your study material can cause your brain to get tired and lose focus. In fact, if you decide that you don’t need to take a break and plan to study for an extended period of time, then your plan will backfire, as your brain will take a break anyway. Setting a timer allows you to study for the amount of time that you should, as well as take breaks when you should. When we encourage you to set goals, we are not referring to your main goal of passing the real estate exam. We know that when you are trying to cover a large amount of material, it can feel overwhelming. A good tip to follow is to break up the material into more manageable pieces that you can cover prior to your exam. By setting these smaller goals, you will be able to focus on a much more reasonable portion of the material at a time and also keep an eye on the calendar to make sure that you are on target for the test day. Continuing Education for Licensing wants to help you ensure that your test preparation is as smooth as possible, which is why we offer these tips in today’s post. Be sure to call and speak with one of our consultants today to learn the continuing education courses and exam preparations that we offer. We are here for all of your real estate licensing needs.